The reviewer borrowed a copy of the book from the public library. I think I have found my favorite nonfiction book of the year. One glance at the cover of The Scraps Book, and I knew it was something special. 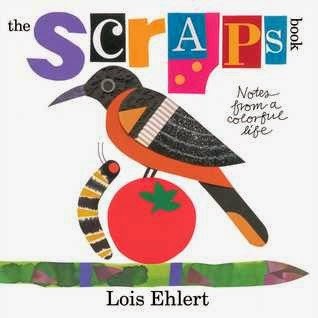 This picture book autobiography about the life and work of Lois Ehlert full of kid-appeal! Ehlert tells the story of her life in a simple yet engaging style for young readers. She embeds photos from her past throughout the story. Bright collage and paint illustrations are placed throughout the book. A trip to the grocery store provided the inspiration for the fruit and vegetable illustrations from Eating the Alphabet. Her sister's cat gave her the idea for Feathers for Lunch. Readers will enjoy seeing Ehlert's sketches as she plans out the pages of Feathers for Lunch. With each page turn, readers will discover more examples of Ehlert's signature collage and primary color illustrations accompanied by a narrative explaining how or why she created the pieces. Illustrations from Snowballs show readers how art can be made with everyday objects. A toothbrush was used to spatter paint on the owl in Lots of Spots. The Scraps Book is more than an autobiography; it's an homage to making art, instructing readers to use material from around the house. Ehlert tells readers it's o.k. to make a mess. It's the perfect book for an author study of Ehlert, but I also hope librarians and teachers share it with children to inspire them to be creative.